The Federal Election Commission’s third quarter financial reporting is out, and it presents an interesting contrast in the NJ-3 congressional election. 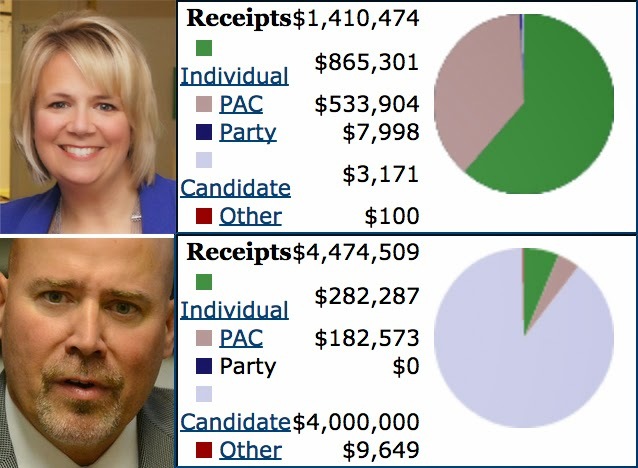 Despite the fact that some of the press has been giving the impression that the two candidates are dead even in fundraising, the FEC report shows that North Jersey’s Tom MacArthur is way ahead of district resident Aimee Belgard in the money race. As of September 30, the Belgard campaign took in $1.4 million, contrasted to the MacArthur campaign of $4.5 million. Tom MacArthur has said that he will spend whatever it takes to win this election, and that’s one statement that he is holding true to. Almost 90% of the campaign money comes from a “loan” that he made to his own run. Contrast this to Belgard’s campaign, where 61% of her money comes from individuals – with the average contribution less than $100. MacArthur’s vast wealth comes from his time as an insurance company executive, during which time he was accused of stalling or denying payments to disaster victims and refusing to pay overtime to his employees. The former Randolph mayor is against legislation promoting pay equity and for tax breaks for rich people like himself. If the election for U. S. Senate were held now the incumbent U.S. Senator Cory Booker would receive 47% of the vote and Republican challenger Jeff Bell 37% according to a just-released Quinnipiac University poll. It is surprising that the race is so close. As of June 30 Booker reported to the FEC total disbursements of $12,682,311 (last 18 months) and current cash on hand of $3,489,139. Bell reported total disbursements of $231,770 (last 6 months) and cash on hand of $0. Booker has been a state-wide, well-known person for years beginning with his initial candidacy to his incumbency as Newark’s mayor and more recently as U. S. Senator. The election is still three months away and as more people get to know Bell his support may decline. In the favorable/unfavorable opinion of Bell the results were 16%/5% with 77% who said they had not heard enough about him. Booker was 47%/27% with a surprisingly large number of 23% who had not heard enough. Booker, as the Democrat incumbent with a huge war chest in a state which regularly sends Democrats to the U.S. Senate, has a clear advantage. He also has some work to do. In his Special Senate election last year he defeated the ultra-right Steve Lonegan 740,742 (55.5%) to 593,684 (44.5%) – a closer race than many expected and in spite of vastly overspending Lonegan. In the Quinnipiac poll Booker commands 85% of the Democrats versus 9% of the Republicans. However he has only 42% of the Independents and 40% of men. These are two categories in which he needs improvement. Many were shocked today to learn that in Virginia the prominent Eric Cantor, a conservative Republican and House Majority Leader, was defeated in the primary by a Tea Party candidate. In Republican dominated congressional districts such resurgence of the Tea Party, which is not a Party, has nothing to do with tea, and is only vaguely related to a historic Boston event, should not be surprising. In the wake Cantor has stepped down from his leadership position. In New Jersey we saw the Tea Party’s influence in the Primary races. In CD 3, where incumbent Jon Runyan (R) resigned effective the end of this session, “establishment” candidate Tom MacArthur (R) received 15,261 votes, but Steve Lonegan (R) supported by Tea Party and other arch-conservatives, garnered 10,314 votes. In CD 7 Leonard Lance (R) won 15,609 votes in the primary narrowly beating the frequent Tea Party candidate David Larsen who received 13,105 votes. In CD 11, another Tea Party supported candidate Rick Van Glahn received a respectable 7,700 votes against incumbent Rodney Frelinghuysen’s 15,379 votes. While writing this diary, I am listening to incumbent Scott Garrett (R) (CD5) on his “Telephone Town Hall Meeting” where he takes calls from constituents, so far all friendly. Garrett had no opponent in the primary because he is beloved by the Tea Party, as well as banks and financial institutions. .
CD3 Democrat Aimee Belgard is up with her first TV spot. It’s a biographical piece called South Jersey Families. Belgard’s been a BurlCo freeholder only since last year, and despite the fact that the Democratic organizations in both District Three counties have endorsed her, voters in her home county and in Ocean may not know her yet. Here’s the ad, which hits an anti-Tea Party note. Belgard faces a primary Tuesday against a lesser-known Democrat. But on the Republican side both of the candidates seeking their party’s nomination – Steve Lonegan and Tom MacArthur – are carpetbaggers. Lonegan, perennial candidate and former Bogota mayor is the best-known right wingnut in New Jersey, and the Jersey boy Sarah Palin picked to endorse, and I’d be delighted to run against him if I were Belgard. What do you think, Blue Jersey? The absolute duel between CD3 Republicans Steve Lonegan and Tom MacArthur and the less-juvenile primary contest between the CD12 Democrats feed eporters a steady stream of endorsement announcements. Some appeal to one or more ethnic or interest group. Most of them won’t matter even to 4×4 primary voters. CD3 Republicans Steve Lonegan and Tom MacArthur, carpetbaggers smelling opportunity both, faced off this weekend on NJTV with the sober grownup Michael Aron refereeing. The long knives come out early, with fireworks starting at around minute 12. They call each other liars. “Callous.” Lonegan accuses his opponent of insurance fraud, and calls him a “liberal.” MacArthur accuses Lonegan of being a terrible landlord, and a loser. A couple of things from Lonegan are especially revolting; his apparent feeling about diversity, and his let-’em-stay-homeless position on Sandy aid that probably don’t go down well down in CD3. As a friend described it, it’s all them but with an extra dose of the crazy. On the other side, Aimee Belgard looks to breeze through a primary against Howard Kleinhendler. I’ll let you find the GOP websites on your own if you want. Political strategies are becoming more convoluted and confusing. A liberal-leaning independent funder, Patriot Majority USA, rather than spending funds in the CD 03 House of Representatives race to support Democrat Aimee Belgard has in late May paid about $104,000 in direct mail and TV and on-line advertising to oppose her leading Republican opponent the wealthy Tom MacArthur. In earlier years such funding would have gone directly to Belgard’s campaign and she would have decided how to spend it. Today outside operators (some less independent than others) make key decisions. Aimee Belgard has amassed $474,502 in contributions through May 14, whereas her weaker Democratic opponent Howard Kleinhendler has raised $54,991. The need to damage a Republican opponent in this Primary takes precedence (according to the outside funder) as Belgard seems positioned to win her own Primay. Opposition funding in the long run is no guarantor of election victory. Aimee Belgard will need to continue strengthening her campaign staff, hone her message, increase volunteers and raise more money for her candidacy. Her election could bring us another Democratic voice, one or probably two women representing us, and a majority Democrat delegation in Washington. Her election is achievable but not certain in this district which has swung both Republican and Democrat in recent elections.